2:15 pm David C. Nieman, PhD, Appalachian State University and the North Carolina Research Campus Title: A multi-omics approach to interpreting the influence of flavonoids in countering exercise-induced physiological stress. PhenHRIG 2017: Plant Phenolics Alter Microbiome and Human Health. 2:35 PM – 3:15 PM: Polyphenols and Gut Microbiota Interaction and its Beneficial Role in Obesity-Linked Diseases. With regret Drs. Puupponen-Pimiä and Aura (VIT Finland) had to cancel due to health reasons. Saturday April 22 1-5pm Room TBA . Speakers: Specific Titles To Be Announced Soon! See you soon in Chicago for another great PhenHRIG symposium! PhenHRIG 2016 SYMPOSIUM: FLAVONOIDS/POLYPHENOLS & EPIGENETICS: IS THERE A CONNECTION? PhenHRIG will provide four GNLD awards for novel student phenolic research. Student research need not pertain strictly to the topic of epigenetics and need only pertain to characterization of phenolic biological activities or chemistry. The four student awardees will receive a $100 prize and will be required to give 5-10 minute research presentation. To be considered, applicants must be a first author on a poster presented at EB. Author needs to send the abstract that was submitted to Experimental Biology as a PDF to phenhrig@hotmail.com by the March 21st deadline. Award winners will receive notification by March 23rd. The PhenHRIG 2016 symposium is entitled: Flavonoids/Polyphenols and Epigenetics: Is There a Connection? Additional information about the speakers, student awards, sponsors, and PhenHRIG can be obtained at our organizational website http://phenhrig.org. PhenHRIG will provide four awards for novel student phenolic research. Student research need not pertain strictly to the topic of epigenetics and need only pertain to characterization of phenolic biological activities or chemistry. The four student awardees will receive $100 a prize and will be required to give 5-10 minute research presentation. To be considered, applicants must be a first author on a poster presented at EB. Author needs to send the abstract that was submitted to Experimental Biology as a PDF to phenhrig@hotmail.com by the March 10th deadline. Award winners will receive notification by March 15th. 1:00 pm- Introduction Dr. Myron Gross, PhenHRIG Chair, University of Minnesota. “Chocolate, Wine and Phenolics”: PhenHRIG Reception in Room 155, 5:00-6:30 pm–> Immediately following the PhenHRIG symposium, join us for some enlightened conversations about the health benefits of dietary phenolics at our casual reception. The reception will feature a wine and chocolate tasting led by a local artisan chocolatier, as well as educational displays on the science of cocoa and chocolate. Additionally, refreshments will include the broad phenolic profile of cocoa, pistachios, almonds, raisins, cranberry juice, and of course red wine. Sponsored by The Chocolate Council of the National Confectioners Association. 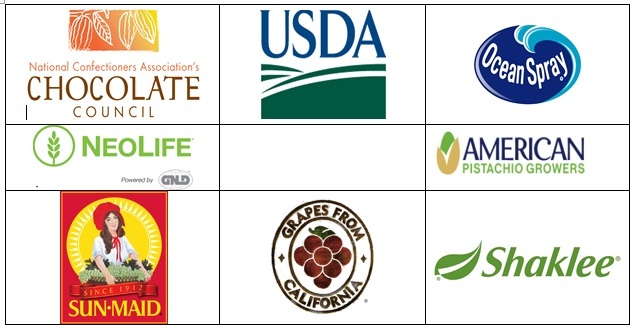 PhenHRIG Program Sponsors: dmark consulting LLC, Ocean Spray Cranberries, Neolife Nutritionals, American Pistachio Growers, California Table Grape Commission, GNLD, Sun-Maid Growers of California, Shaklee, National Confectioners Association, and USDA-ARS Beltsville. Abstract: Plant phenolic compounds may aid in the maintenance of cognitive function and prevent neurological decline in human health and disease. This symposium will address the identification of the phenolic compounds and their food sources that provide these neurological effects. The speakers at PhenHRIG 2014 will evaluate the relationships and mechanisms between dietary phenolics and cognitive function. For additional information please visit: http://phenhrig.org. 1:00 pm- Introduction Dr Myron Gross, PhenHRIG Chair, University of Minnesota. Sponsors: Neolife Nutritionals, American Pistachio Growers, California Table Grape Commission, GNLD, Sun-Maid Growers of California, Shaklee, National Confectioners Association, and USDA-ARS Beltsville. Saturday April 20th, 1-5 pm, Boston Convention Center Room 152. Abstract: Nutrigenomics refers to gene-diet interactions resulting in the potential for regulation of gene expression, in this case, by phenolic compounds in the human diet. Phenolics from plants appear to create a robust nutrigenomic response in consumers that may be important for interpreting the dietary effects of phenolics. PhenHRIG 2013 will describe phenolic-nutrigenomic interactions with regard to chronic diseases and their mechanisms. For additional information for to http://phenhrig.org. 1:00 pm-Introduction Myron Gross, University of Minnesota. 3:45 pm- Dr Christina Khoo, Ocean Spray Cranberries, Inc.
4:20 pm- Qiwen Shen, Human Nutrition, Ohio State University.